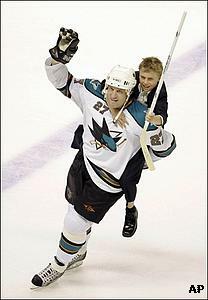 Sharks' center Jeremy Roenick skates with his son Brett on his back to celebrate his 500th career goal which came in the second period of San Jose's 4-1 win against Phoenix. Jeremy Roenick’s 500th career goal was one of the oddest of his career. The San Jose center became the 40th player in NHL history to score 500 career goals when he scored 6:35 into the second period Saturday night in the Sharks’ 4-1 victory over the Phoenix Coyotes. Roenick reached the milestone with a fluke goal that came after he dumped the puck around the right boards. The puck took an odd bounce off the glass and went toward the net. Phoenix goaltender Alex Auld scrambled back and tried to stop the puck in front of the goal line with his stick — but instead, he pushed it into the net. As soon as the sellout crowd at the HP Pavilion realized that the puck had actually gown into the net, fans stood and cheered for the third U.S.-born player to reach the milestone, after Mike Modano and Joe Mullen. After the game, Roenick skated a few victory laps carrying his 10-year-old son, Brett, on his shoulders after being announced as the No. 1 star — with Brett brandishing the historic stick. It was the second time the Roenicks have done that. The last time was in celebration of his 10th career hat trick — against the Sharks last December. Roenick signed with the Sharks this summer after scoring just 11 goals for Phoenix last season. Sharks GM Doug Wilson — Roenick's first roommate in Chicago — signed him as a free agent. Roenick didn't forget; he gave Wilson the puck in appreciation. Roenick’s goal put the Sharks ahead 2-1. Phoenix led 1-0 after one period on a goal by Steven Reinprecht at 9:00. The Sharks tied it 3:11 into the second period when rookie Devin Setoguchi scored the third goal of his NHL career. Another rookie, Torrey Mitchell, whipped a backhander past Auld from the slot after a turnover at 5:26 of the third period for a 3-1 lead. It was Mitchell’s second NHL goal — he got the first one on Friday. Sandis Ozolinsh, a former Shark defenseman who recently returned to the team, scored on a 35-foot slap shot during a power play at 10:29. Roenick’s goal was his fifth of the season, though four of the five have been game-winners. Roenick made a spectacular NHL debut in 1991-92, scoring 53 goals and helping the Chicago Blackhawks reach the Stanley Cup Final. He had 50 goals the next season and 46 in 1993-94, but was traded to Phoenix after dropping to 32 goals in the 1995-96 season. Roenick spent the next five seasons with the Coyotes, scoring at least 24 goals each season with a high of 34 in 1999-2000. Phoenix traded him to Philadelphia after 2000-01, when he had his last 30-goal season. He spent three seasons with Philadelphia before being dealt to Los Angeles prior to the 2005-06 season. He had a career-low nine goals in 58 games for the Kings that season, then played with Phoenix in 2006-07. Roenick now has 500 goals and 680 assists for 1,180 points in 1,267 NHL games, though No. 500 wasn’t going to win any awards for style. Roenick was immediately mobbed by his teammates. The game was delayed a few minutes as Roenick skated in front of the Sharks' bench with the puck raised above his head. He pointed into the stands as the crowd gave him an extended standing ovation. Even a few of the Coyotes joined in tapping their sticks.